CHICAGO, USA -- With the salient exception of Georgia, NATO basically ignored its own immediate eastern neighborhood at NATO’ Chicago summit (May 20-21). 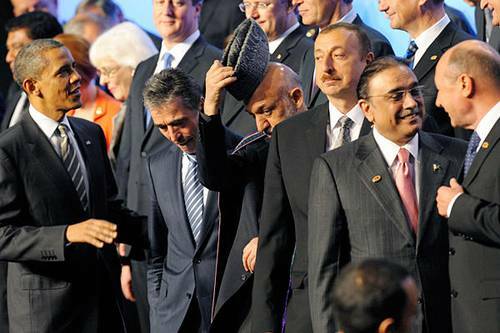 NATO Chicago Summit, May 21, 2012. Europe’s East – a “gray zone” of six countries bordering on NATO and the EU – faces a deepening security vacuum and Russian re-expansion. This region is the arena of protracted conflicts (Russia-Moldova, Russia-Georgia on two fronts, Armenia-Azerbaijan), territorial occupations, ethnic cleansing, massive Russian military bases (prolonged in Ukraine and Armenia since 2010 for decades to come), and failing tests of NATO’s open-door and partnership policies. NATO seems to treat Europe’s East with benign neglect, which deepens from one summit cycle to the next; NATO’s policy from Lisbon to Chicago has confirmed the pattern. NATO/US disengagement and Russian sphere-of-influence rebuilding are concurrent processes, mutually reinforcing in this region. Benign neglect tends to grow deeper and even becomes institutionalized with the passage of time. In this region, it takes the form of conceding primary authority on peacekeeping and conflict-mediation to Russia, which acts within institutional formats that constrain the West and exclude NATO outright. Except for a fleeting moment in 2002, NATO has recused itself from a peacekeeping role in its eastern neighborhood. At the Chicago summit, NATO again urged all parties to the protracted conflicts to respect those same institutional formats (meaning: 5+2 in Moldova, the Geneva format in the case of Georgia, the “Minsk Group” in the Armenia-Azerbaijan conflict) despite their ineffectiveness. But the concern seems to remain at the declaratory level (Chicago Summit Declaration, May 20). Overcommitted to failed expeditionary operations in distant theaters, NATO has no security solution to offer in its eastern neighborhood; and – as the Chicago summit confirmed – NATO lacks the collective inclination to provide one. While some NATO partners become security providers in the region, the Alliance itself has missed the chance to become an effective security actor in Europe’s East. Again, with the singular exception of Georgia, others are scaling down their erstwhile ambitions for closer cooperation with NATO. The Ukrainian government has regressed from membership aspirant during Viktor Yanukovych’s first premiership (2002-2004) to staunchly “non-bloc” under Yanukovych’s presidency. At the Chicago summit, Yanukovych limited his role to seeking business opportunities for Ukraine in the context of NATO’s withdrawal from Afghanistan. He offered to lease Ukraine’s Soviet-era, heavy-duty transport aircraft for NATO’s reverse transit, and to repair Soviet-made military equipment in Ukraine for the Afghan army’s use. For its part, Azerbaijan joined the non-aligned movement in 2011 – a move that precludes NATO membership aspirations, though still allowing other forms of Azerbaijan-NATO cooperation. In the Karabakh conflict, Russian-backed Armenia occupies territories of Western-oriented Azerbaijan. Amid Western indifference to this situation, Azerbaijan seeks political support among the non-aligned countries. Baku continues to seek an upgraded individual partnership agreement with NATO, but the Alliance procrastinates. Azerbaijan is a troop contributor and a crucial way station for NATO forces operating in Afghanistan. President Ilham Aliyev attended the Chicago summit in that context. Armenian President Serzh Sarkisyan, on the other hand, followed Russian President Vladimir Putin’s example and declined to attend the summit. Azerbaijan obtained a degree of satisfaction when the Chicago summit’s communiqué endorsed Azerbaijan’s “territorial integrity, independence, and sovereignty” along with those of Georgia and Moldova (Chicago Summit Declaration, May 20). This basically restates the formulation from NATO’s 2010 Lisbon summit communiqué; but the restatement was in doubt until the last moment, as diplomats involved in the anachronistic “Minsk process” sought to change the Lisbon formula to Azerbaijan’s detriment. Turkey defended Azerbaijan’s interests in the drafting process. Presidents Dalia Grybauskaite of Lithuania and Traian Basescu of Romania expressed concern over arms sales by certain Western European countries to Russia. In their speeches at the Chicago summit, Grybauskaite and Basescu noted that such arms sales can generate security risks to NATO allies and partners. Basescu urged NATO to introduce controls over arms sales by NATO member countries to non-members (meaning essentially Russia). Such procedures should involve advance notice to the Alliance and a certification that the arms sales would not pose additional risks to allies and partners in the region. France is going ahead with the sale of Mistral-class amphibious assault warships to Russia. On the eve of the Chicago summit, Italy delivered samples of Centauro tanks and Iveco armored vehicles to Russia for testing and possible procurement. History’s most successful alliance seems painfully irrelevant to the security of its own eastern neighborhood, from Ukraine to the South Caucasus. Yet, this neighborhood sits astride the Alliance’s vital energy supply routes to Europe and logistical corridors to Asia. “Relevance” is a particularly sensitive word in the NATO lexicon. From the 1990s onward, NATO leaders serially insisted that NATO remained “relevant” and had to prove it. That proof, however, has yet to materialize in Europe’s East.